Chennai-based hyperlocal delivery and logistics startup Genie Solutions Pvt Ltd has acquired food delivery firm Dinein.in an all-stock deal, a company statement said. As part of the deal, Genie will acquire the Dinein.in brand, the 25-member team, the delivery fleet, restaurant partner contracts, technology and the startup’s call centre business, the statement said. The financial terms of the deal were not disclosed. Genie is also looking to strengthen its presence in Chennai and build better technological infrastructure before going to other markets. Dinein.in, run by Easy Deli Logistics Pvt Ltd, was started in late 2012 by Vinit Chordia and worked with more than 250 restaurants in Chennai to deliver food to customers. The startup claims that it was fulfilling about 6,000 orders a month in 2017. Mithun Sacheti, founder of online jewellery firm Caratlane.com (now a part of Tata’s Tanishq) who was an investor with Dinein.in will serve as a mentor for Genie. “We see this as a great opportunity to grow and offer great experience to customers. With a focused food delivery service and a pureplay logistics platform coming together, creating a wholesome service that can help users get anything they need at their doorstep,” said Chordia in a statement. Founded by Rakesh Mani, Sreekesh Krishnan and Parth Shah, Genie is a bike-based, tech-enabled logistics platform which serves both consumers and businesses in Chennai. 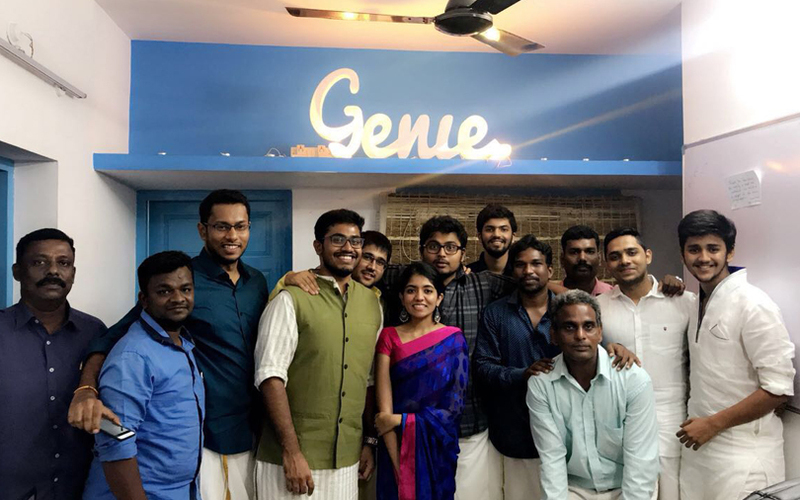 Krishnan, who is a graduate in electronics engineering, has co-founded other startups and has held stints in marketing prior to setting up Genie. Mani, who oversees operations and human resources at Genie, previously led social development projects in education, environment and women empowerment. Shah, a chartered accountant by profession, has previously worked at Deloitte and also co-founded a startup, Instadel. Run by Genie Solutions Private Limited, the startup said its current focus is to grow and consolidate business partnerships. It currently claims to do more than 10,000 orders with a fleet of over 100 people. The firm, which was founded in early 2015, had suspended operations on 31 March 2017 due to lack of funds. However, the startup resumed business in May 2017 after it raised $250,000 from a group of unnamed high net-worth individuals.